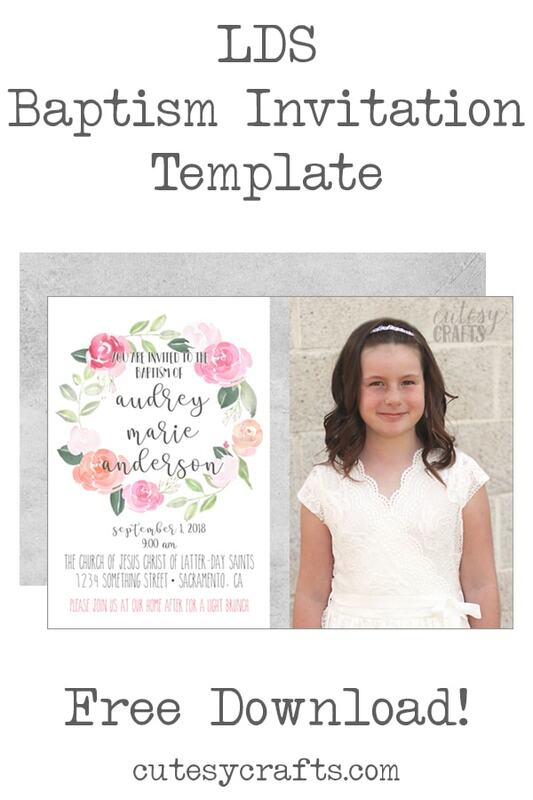 A couple months ago, I shared the Free LDS Baptism Program Template that I made for my niece. Someone emailed and asked if I had an invitation to go with it. I designed one for her, and thought you all would like to have the file too. So today, I’m sharing the free LDS baptism invitation template to match the programs. You’ll need to install a few things before you can customize the template. 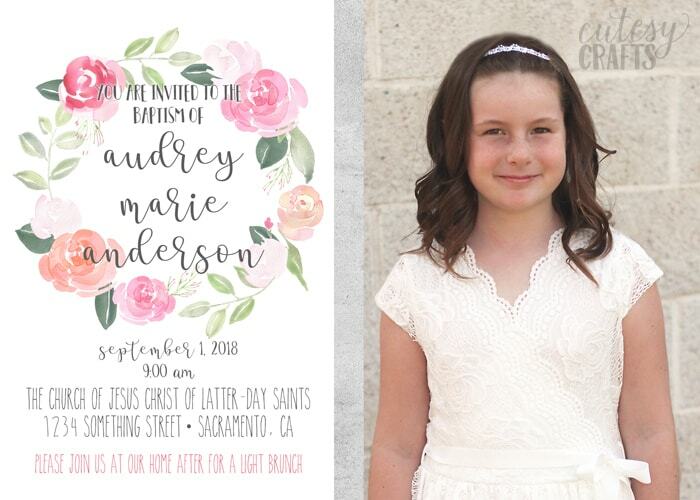 I used Photoshop Elements to design this free LDS baptism invitation template. If you don’t own it, you can usually find a free trial from Adobe. You will also need to download and install free fonts Personality, Stea, Ke Aloha, The Skinny, and Moon Flower. You will also need Myriad Pro, which I believe comes installed on most computers. If not, it’s just for the big dot after the city, so you can use something else. You will be able to add your own photo to the right side. Make sure the photo layer is under the gray bar in the middle, so the bar doesn’t get covered. The artwork for the beautiful flower wreath comes from Paper Sun Design. You can purchase that on Etsy if you’d like to make other coordinating items. The invitation is set up to be printed as a 5×7 invitation. I also included a 5×7 jpeg file of the gray texture for a double-sided invitation. The lady that I designed it for used a collage of other photos for the back, so you can totally do that instead. I like to use a free online collage program called BeFunky for that. Make sure to look at what margins or bleed range your printing company uses so nothing important gets cut off! You may need to resize parts of the invitation to conform. 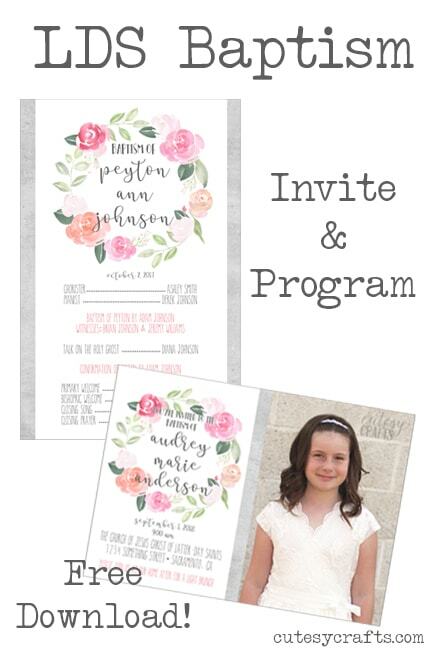 Hope you get some good use out of this free lds baptism invitation template! If you’d like to download the matching lds baptism program template, click here. And if you’re looking for a cheap LDS baptism dress for your little girl to wear, this is the one from the photo that we bought. I got the off-white color, and it was perfect! I don’t know that it’s quite heirloom quality, but it was beautiful for the event, and didn’t cost a fortune. You might want to put a white tank top underneath, since the fabric is a little thin on top. It was so cute that my sister bought one for my niece too. 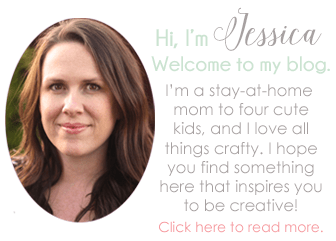 Cutesy Crafts is a participant in the Amazon Services LLC Associates Program, an affiliate advertising program designed to provide a means for sites to earn advertising fees by advertising and linking to amazon.com. This is a beautiful invitation! What a wonderful thing to do. Unfortunately, I only have boys, but I just wanted to let you know I think it’s wonderful that you put this out there at no charge.